Any dart that bounces off the board or falls out during the round does not count towards your score nor can it be replayed. In official matches there is often a five-second rule. This rule states that darts must stay in the board for five seconds after the third and final dart is thrown for the points to score. To determine who goes first, players will "diddle for the middle." Each player throws a single dart at the dart board and the player who gets a dart closest to the bull's-eye goes first and chooses the game to be played. 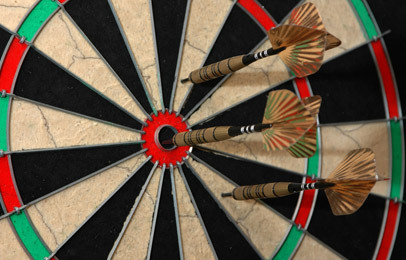 If the first player hits a bull's-eye, the other player can ask for the dart to be removed so that they can have a clear shot. In some cases you also decide who starts with a coin toss head or tail, the winner simply starts the game. When playing in teams, opposing team members take alternate turns. You should never cross the throwing line with any part of your foot. If your foot does cross the line, your turn is null and void. To ensure accuracy, you should always record scores while the darts are still in the board. In the ending of a game, you don't have to throw all of your darts (unless explicitly stated in the rules of the individual game). You should always remove your own darts. You may approach the board at any time during a round to check the location of a dart. You may not, however, touch any dart until the round is complete. In tournaments you can ask the referee what you have hit. Always give the thrower room to throw, at least two feet. This is out of consideration as well as safety. Always begin and end each game with a handshake. Dart is a gentleman sport do not forget.